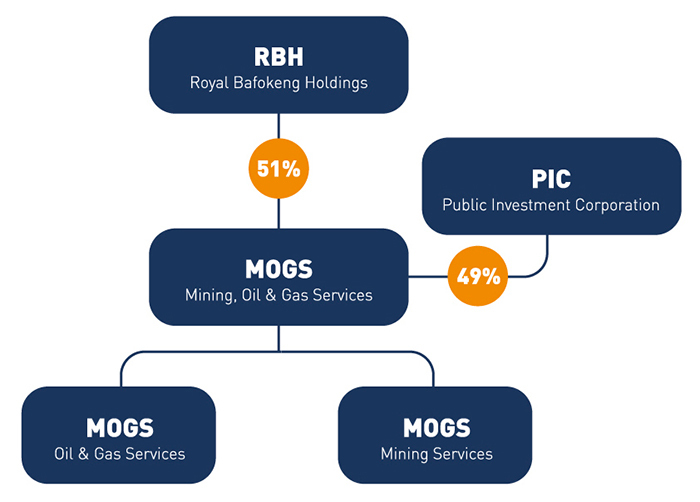 MOGS is majority owned by Royal Bafokeng Holdings. In 2016, the Public Investment Corporation purchased a 49% stake in the company. Royal Bafokeng Holdings (RBH) is an African community investment company which, together with its sole shareholder, the Royal Bafokeng Nation Development Trust (RBNDT), is entrusted with the unique responsibility of peserving and growing the financial capital of the Royal Bafokeng Nation (RBN) and ensuring its long-term future. PIC is a public asset management firm wholly owned by the South African Government. It’s clients are the public sector including the Government Employees Pension Fund, which contributes 90% of the funds that PIC manages.